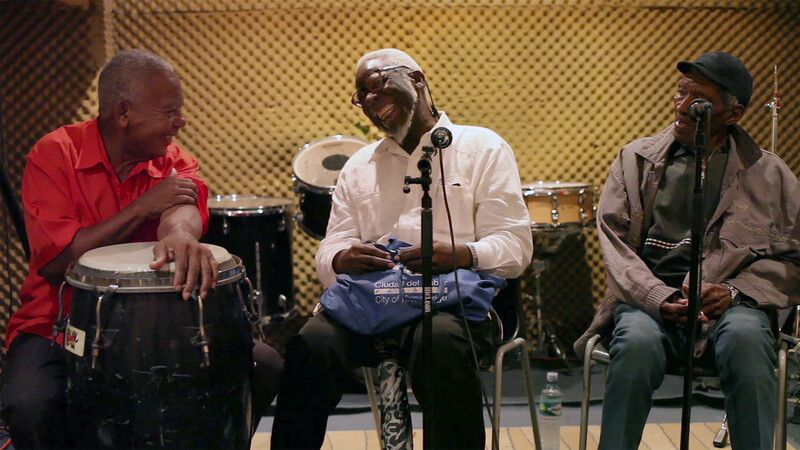 Una Noche De Calypso is a festive, musical documentary that gives an analysis of the Panamanian calypso group, Amistad. It brings into perspective cultural, religious, political, and historical views surrounding calypso in Panama, from its origin to its present. The journey and history of the group is intricately highlighted, with themes of friendship, discrimination and Imperialism being explored. As the group puts on an exhilarating performance at their concert, Director Fernando Munoz aims to raise awareness and showcase the art form with a host of interviews, rehearsals and enlightening words from band members, artistes and scholars alike. The 83 minute documentary shows group members Leslie George, Monchi, Ringing Bell, Palmer, Victor and Edward as they relive youthful moments of when they became involved in the craft. They show off their unique skills of writing, singing and playing instruments whilst comically teasing about rehearsals. They also discuss the ups and downs of being a part of the group for decades as well as being able to work with idols who paved the way for them. Calypso as a genre of music has changed dramatically over the last few decades. At its best, calypso is deeply poetic and is punctuated with witty lyrics and an upbeat tempo; however, in the last two decades or so it has often been seen as a dying art form with mainly traditionalists fighting hard to keep it alive. This is true of these passionate artistic men. Scenic visuals are momentarily displayed to give a clear picture of what it was like living in the age that brought about the birth of Calypso music. From the building of the Panama Canal to the migration of West Indians to the country, it is thoughtfully and sensitively portrayed. The dynamic genre of music is explained in such a way that even non-calypso lovers would be intrigued. The West Indian influence serves as a great combination that one could only describe as a melting pot. To top it off the energy and joy coming from the audience at the concert, in the film, was just heart-warming. It is quite difficult to not feel a sense of pride as a Caribbean audience. The aroma of rhythmic, exciting and informative language engulfed with singing and dancing leaves you mesmerised and excited to learn more about calypso. It is definitely an eye opener as well as hip jerker and if you’re interested in music or anything remotely cultural it’s a must see.